Ever since (it's been so long now, you see) I discovered that Trenton Lee Stewart really enjoyed The Gruffalo I had to know what it was about. I saw the cover and thought it was likely to be a hit with Bookworm1 and so I went ahead and ordered a copy. I was right about Bookworm1. But the person who has requested the most re-reads of this book is Bookworm2 (age 3.) We think he likes it because it's a story of how the littlest creature got the best of all of the larger creatures. 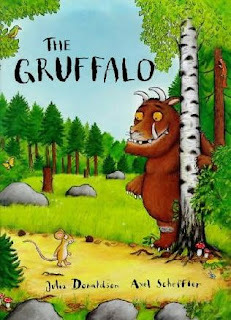 If you are unfamiliar with The Gruffalo - as I was - I have to say it's a pretty cute story. There is a small mouse in the woods who keeps being invited over for dinner by various other animals. An owl asks him up to his house for a bite, and a snake offers him food and drink as well. Mouse always thanks them for their offer but tells them he's waiting to meet up with a Gruffalo. Mouse describes a perfectly terrifying creature who loves nothing better than to eat owls and snakes. This news makes the predators run away from mouse which is, of course, the intended purpose. Lo and behold though, there is such a creature and mouse has to think fast to avoid becoming a yummy snack for this big, hairy beast! * This book has sold over 10.5 million copies. * It was the best-selling children's book in the UK in 2000. * It has been translated into multiple languages, including Dutch, German, Hebrew, Swedish and Turkish. * It was made into a short animated film which Bookworm1 is curious to see. We've made no promises. * It has been adapted for the stage by the Tall Stories theater company. Apparently we're behind in The Gruffalo Craze. But we're catching up! Hehe!It does seem perfectly adorable and clever. It's yet another I'm adding to the list. Thank you! I loved this book, though I don't own it yet. I also discovered it through Trenton Lee Stewart.! I always enjoy stories about a smaller being being able to rule his/her space. It reminded me of the Jewish urban legend of the Golem, a mythical creature of mud that protects its people from harm. I have never heard of this one. I will have to check it out. Fortunately, my library has one! This book holds so many happy associations for me. A friend brought it from England 7 or 8 years ago, and my kids fell instantly in love with it. It was recited around our house for years--I pretty much have it memorized now. Enjoy! We like the Big Hungry Bear and the Red Ripe Strawberry too!